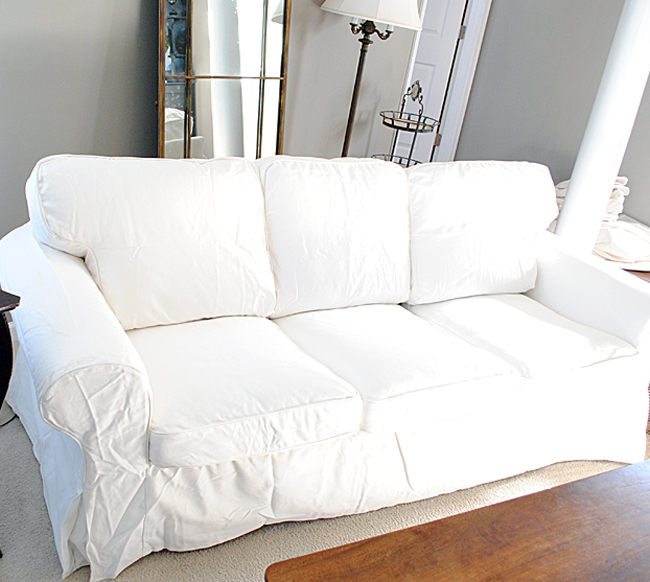 Recently I picked up a new Slipcover for my Ikea Ektorp Sofa. I know I’m not the only one that has this sofa, since I’ve seen it many times all over blogland and Pinterest too. The sofa is well priced, goes with everything, can be changed out easily with different color slipcovers or pillows, and is partially filled with down, which makes it comfy! So no wonder that it’s so popular. The only thing that I don’t like about it, is that the slipcovers are super wrinkly when you get them, and equally as wrinkled when you wash them. However, there is an easy way to get the wrinkles out and it does not involve ironing!! Yay! It’s also much faster than ironing too and you don’t need a steamer or special equipment. All you need is a spray bottle filled with hot water from your tap…. and then smooth out with your hands. That’s it! Soooo easy and it goes really fast! So much better don’t you think?! …and after. 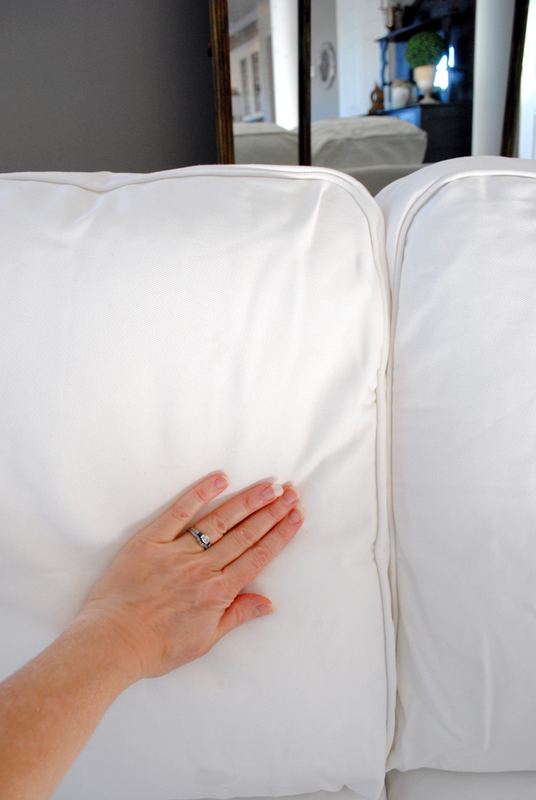 You can see that the slipcover is actually a little bit longer too, which is especially nice if you’ve had any shrinking during the wash. 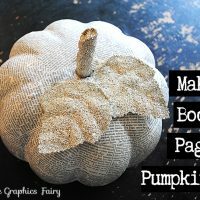 I hope you found this tip helpful! I have ironed these in the past and it took for ever, so this was a huge time saver for me and I hope it will be for you too. P.S. Keep in mind that I have the Cotton Slipcovers. 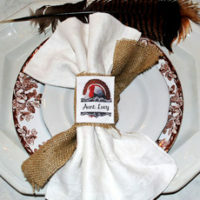 I believe this also comes in a Linen cover, I would not recommend using this tip on the Linen version. I’ve always wanted this sofa, with these slipcovers, and now, if I ever get flush enough to buy it, I’ll know how to take out the wrinkles! Thanks, not only did you do a good thing for your living room, you were kind enough to share it! 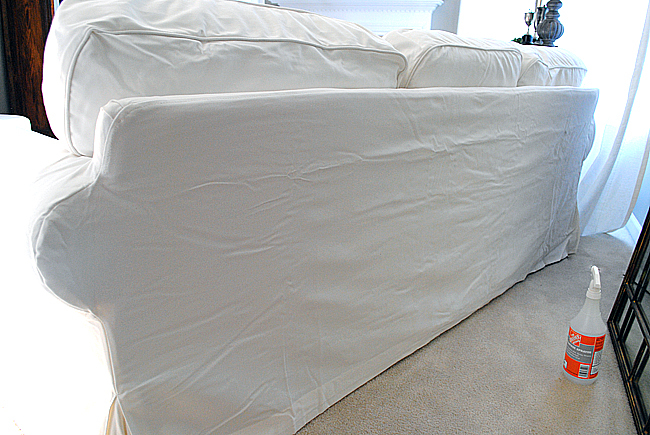 I bought a Sure-fit cover for my sofa and followed an on-line tip for getting the wrinkles out, which was to wash it and put it in the dryer. Well, this didn’t work at all. I will have to try your method. It surely can’t hurt! Thanks! 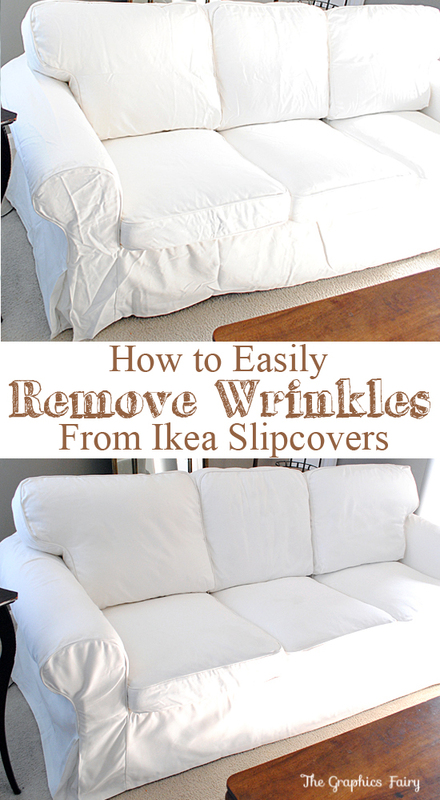 Picking up two slipcovers from Ikea is on my list for next week…thanks for the tip!! That’s so great ! 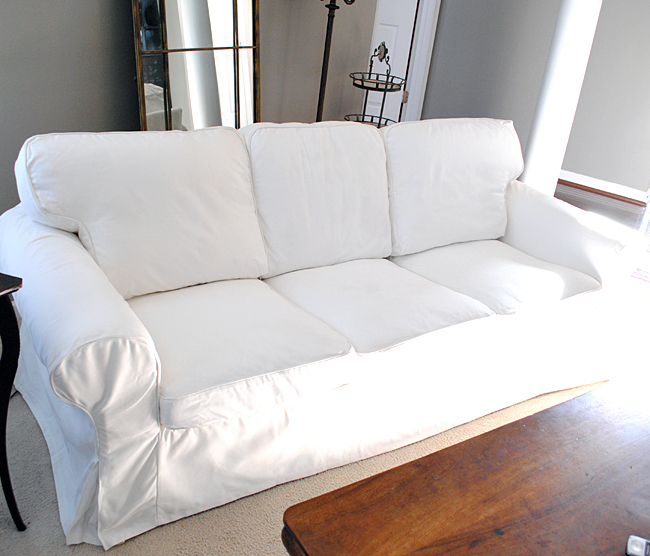 I have one Ektorp sofa and three armchairs, all in white. Merci merci beaucoup for this tip. Hope you understand my English ! Thank you so much for this tip. I have three of those sofas in my living room, white of course, and I have two lovely grand children, a boy (41/2) and a girl (21/2), who love so much my sofas! It’s really a wonderful tip for me. Thank you everyone! I’m so glad you found this tip useful! 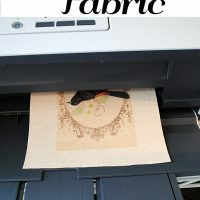 It should save you hours of ironing time, maybe you can use that time to make some crafts instead, which is way more fun than ironing! Just popping in to add to the comments here….that is a good tip – I am hoping to change to this sofa so will bear it in mind….how about putting the almost dry covers on the sofa and ironing then? Hi Joyce, I think this is way easier than using an iron on the sofa! It’s really easy… no heat, no worrying about burning yourself or scorching the fabric, no cord to worry about and your hands are much more light weight! Give it a try, I bet you will be pleased with this method! I’m wondering how long it takes for the dampened covers to dry after you’ve wet them down? Thanks, Karen!!! Great information. 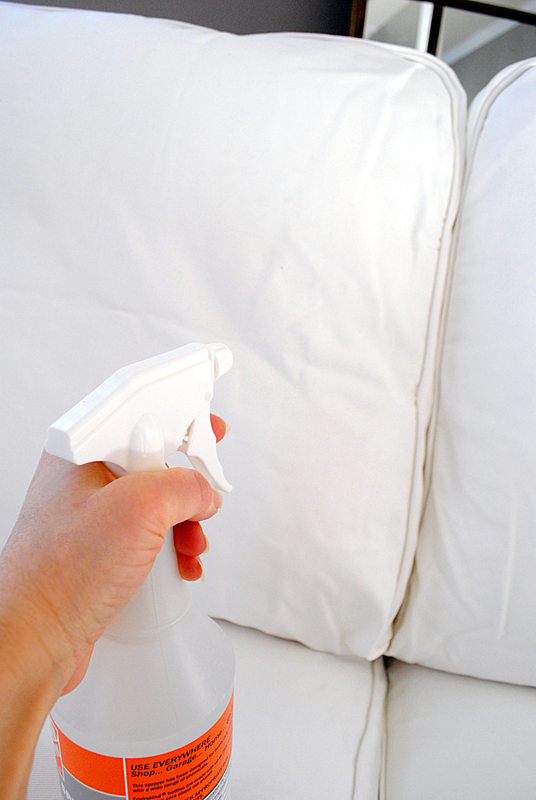 I am curious why you would not use the hot water spray on linen? Will it shrink linen? You are so kind to share this tip! I don’t have the linen one so I can’t test it out, so I don’t want to be responsible for ruining the linen if it doesn’t work out. I’m not sure that the Linen one is washable, so it would be kind of risky and could get damaged. Super tip and so easy…TFS! We often shop at ikea,pronounced (ickia) and have bought quite a few different objects there.In order to shop there we have to travel quite a distance!Our kitchen Cabinets are from there and there was a considerable savings over custom ones.It would have been great to have Ikea when we were starting out as a young married couple,so take advantage and don’t be afraid to think outside of the box!! Oh golly! I was procrastinating cause I couldn’t believe it! I first tried this on my new Jenny Lund Ektorp Stenasa color (white) chairs. This works like a dream. Well, then I had my new sofa cover – same color, but was a much thicker fabric (looks like yours). This was so easy and works beautifully. I had been considering a chemical wrinkle releaser product, renting a steamer, using the steamer I bought from Bed, B & B (got questionable reviews – returning now), taking it to the drycleaner to have them steam them…. Didn’t have to do any of that. I am 65 and my sometimes sore hands managed this quite well. 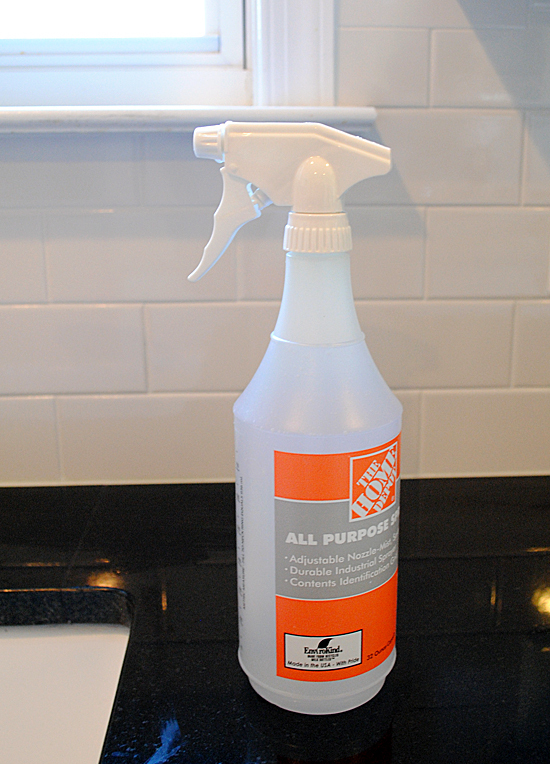 Don’t be afraid to spray heavy – it seems to work better. I am letting them dry out now before I put the sofa cushions on. 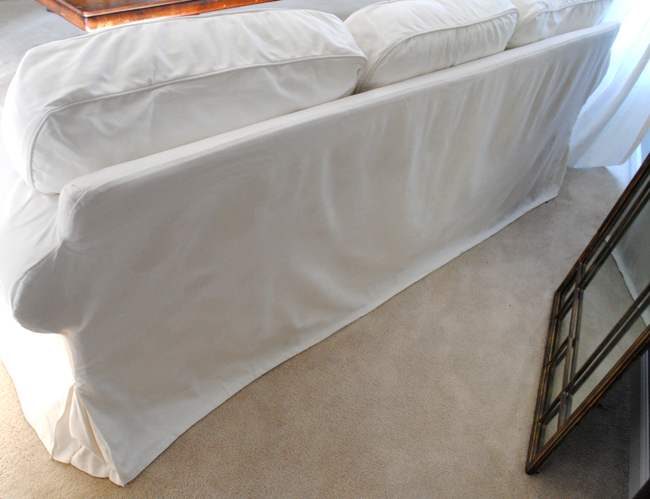 This method even works on the pleated corners. 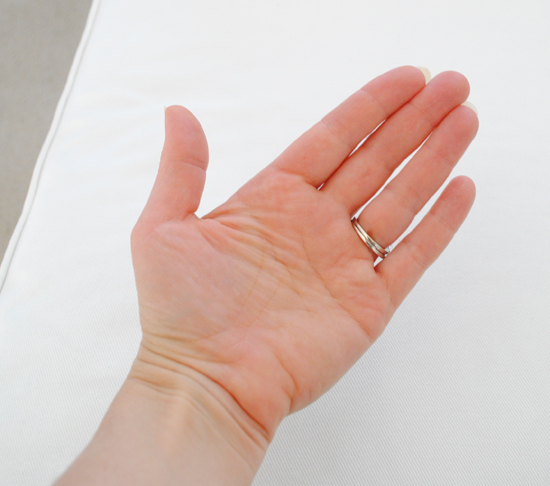 Spray your water, and then take one hand and pull slightly down on the skirt while smoothing with the other hand. I then noticed some wrinkles on my table cloth where my husband had been spraying/smoothing the cushions. I tried spraying the wrinkles lightly and they disappeared. I didn’t have to put it in the dryer with a wet towel. Thank you!!!!!! for this tip!!!!!! Sending a hug!!!! Yay!! You’re welcome Suzanne! It is almost like magic, isn’t it?! This works on bedsheets, as well. Cool! I hadn’t even though of that! Thanks Jeanne, great tip! doesn’t this cause mildew?? I would love to hear from people who have tried this over time rather than just thinking it a good idea or spraying w/out the covers being on the sofa. Thanks! Chandler. A fríend of mine has this sofá and she uses a hair drier as she tightens the fabric and she says it works very well. Try it! Oh yea!! So glad it worked for you Ian! !